Christine DeRosa Senior Zak Ottman finished his final round five under par as Binghamton finished ninth overall at the Villanova Intercollegiate. Halfway through the Villanova Spring Golf Invitational, the Binghamton golf team was struggling. A lackluster opening round left the team near the basement of the leaderboard, and the Bearcats’ top golfers seemed unable to find their stride. But just when it seemed like the team was headed for a lowly finish, BU rallied in the final round, surging up the leaderboard for a ninth-place finish out of 20 teams at the invitational. At the centerpiece of the Bearcats’ comeback was senior Zak Ottman, whose individual turnaround in the tournament was reflective of the team’s rally. Ottman had the worst score of the Bearcat golfers in the first round, trailing all of his teammates with a score of six over par through the first 18. In the second and final round, Ottman was by far the best of his teammates, putting together a remarkable round of five below par that featured seven birdies. Though Ottman’s improvement was the most dramatic, all four of his teammates also lowered their scores from the first round to the last, playing a consistent level of golf that supported Ottman’s performance and allowed it to carry BU up the leaderboard. Sophomore D.J. Griffiths, junior Ryan Rodriguez, sophomore Justin Lane and sophomore Nacho Glagovsky each turned in rounds of one over par. Binghamton was the only school that had all five of its golfers score one over or lower on the final day. It was a stark difference from what the team did the day prior. Sloppy performances on a few of the holes, combined with an inability to accumulate birdies, kept the team behind on the scoreboard for the entire opening day. The par-three third seemed to be the most difficult for the Bearcats, with four of them earning bogeys on the hole. The overall score for Binghamton in the first round was 298, a plus-14, and tied for second-worst of the day, ahead of only last-place Wagner. 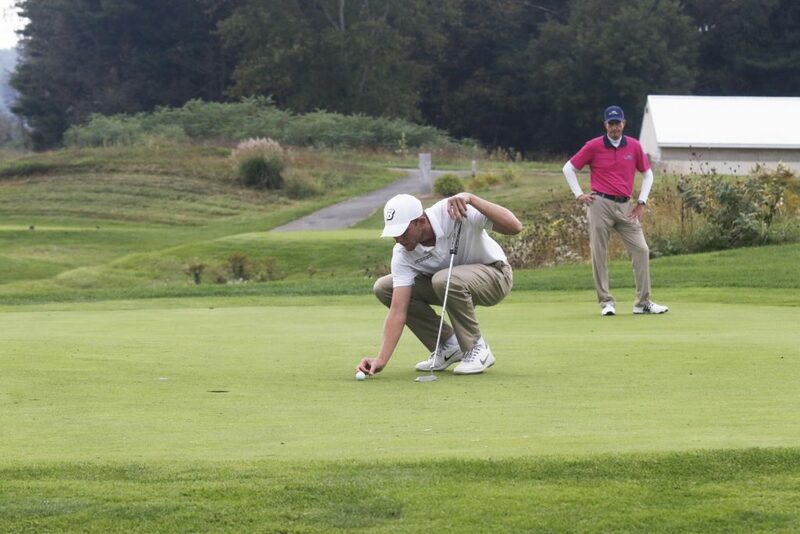 But the following day, each of Binghamton’s golfers started with a clean, empty scoresheet, and took full advantage. Holes that the team mostly parred the day before were birdied in the final round, greatly reducing the team’s score. This trend was particularly evident on the back nine, where the Bearcats had 14 birdies compared to six on the first day. The team’s final-round score was 282, or two below par. It was the fifth-lowest round of the day, and the 16-shot improvement from round one to round two was the third-largest among all of the participating schools. Drexel dominated the competition overall, mustering a combined score of 17 under par for the entire invitational to earn a first-place finish. Akron was close behind them at the end of the first round, but a 286 on day two took the Zips out of contention, allowing the Dragons to win comfortably. Drexel junior Connor Schmidt won individually as well. With the season zooming by, only one invitational remains before the Bearcats travel out west for the much-anticipated Big Sky Conference. The Navy Intercollegiate, a two-day event, begins on Friday, April 19 in Annapolis, Maryland.